On Friday 18th of September, during the 30th session of the UN Human Rights Council, the International Movement Against All Forms of Discrimination and Racism (IMADR), jointly with Asian Forum for Human Rights and Development (FORUM-ASIA), Asian Federation Against Involuntary Disappearances, Franciscans International and Minority Rights Group International, hosted a side event titled “Enforced disappearances in Sri Lanka”. This occasion gave the opportunity of two families of disappeared, Ms. Sandya EKNALYGODA and a wife from the North, to share their traumatic experience. Fr. YOGESWARAN, a human rights defender from the East of the country, joined the panel and considered the culture of impunity characterizing the Sri Lankan justice system and the lack of psychosocial support for the relatives of the disappeared. The expert member of the UN Committee on Enforced Disappearances , Mr. Luciano HAZAN, participated in the event through a video message. Finally, the moderator, Dr. Nimalka FERNANDO, IMADR President, added to the discussion by addressing the need of consultation in order to create a credible mechanism to clarify the fate of the missing persons in Sri Lanka. 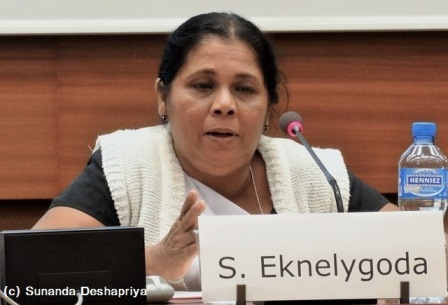 The first speaker, Ms. Eknalygoda discussed the fate of her husband, Prageeth Eknalygoda, a Sri Lankan journalist/ cartoonist and political analyst who disappeared in 2010. Since his abduction, she has fought tirelessly to find her husband’s whereabouts and bring those responsible to account. Her search has taken her before several national and international human rights institutions such as the UN Working Group on Enforced and Involuntary Disappearances. Under the pressure, the Government of Sri Lanka (GoSL) finally opened a criminal investigation this year. Currently 11 individuals, civilians and members of the military police, are in custody and some of them confessed being involved in his adduction. Since then, the investigation is essentially at a standstill and Prageeth’s whereabouts are still unknown. 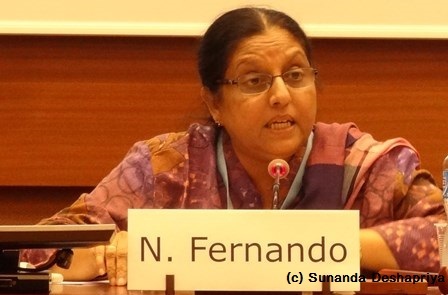 According to her, although the outcome of the last election that ended the Rajapaksa era, there has not been real political change for the Sri Lankan people. The second panellist, a woman from the North of the country detailed how she and her children witnessed the abduction of her husband. Since that day, she is fighting to know the truth and find her husband. As of today, she exhausted all the national remedies but has not received any information from the government concerning her husband’s whereabouts. She visited the United Nations aiming to demand the international community to help her in her quest to find the truth. She said that she documented hundreds of disappearances cases and declared “I am raising my voice for all of them. We want to know the truth about our loved ones”. She finished her presentation by explaining how her life changed since the dramatic event: the trauma of losing a loved one, the sleepless nights and the daily fear of intimidation. 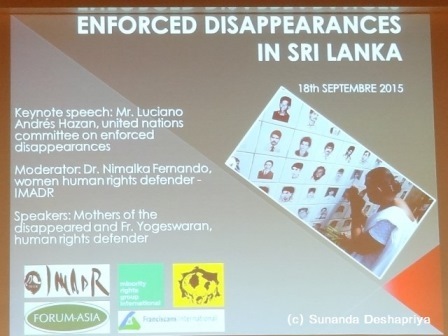 This testimony echoes the observations by the Special Rapporteur on the promotion of truth, justice, reparation and guarantees of non-recurrence, Mr. Pablo de Greiff, on the conclusion of his recent visit to Sri Lanka, who stated that the suffering which follows cases of disappearances generates rights violations on their own and that the GoSL should take immediate action to clarify the fate of the disappeared. Fr. Yogeswaran, a human rights defender from the East of the country, discussed the justice system in Sri Lanka and how the culture of impunity impeded improvement in the fight against human rights violations and the pursuit for accountability and justice. He recalled the failure of the mechanisms put in place in the past by the previous regime. He stressed the need for the new government to ratify the International Convention for the Protection of All Persons from Enforced Disappearance (ICCPED) and to reform its justice system to demonstrate its genuine political will to address past and ongoing human rights abuses. Fr. 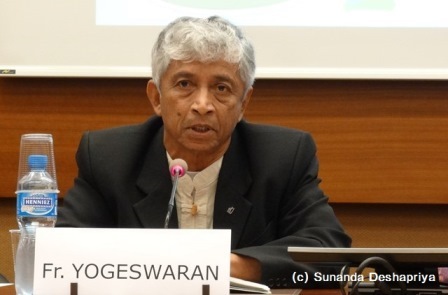 Yogeswaran declared that international experts are needed to adequacy investigate enforced disappearances, giving the example of the issues of mass graves and the requirement of forensic expertise to determine the identity of the bodies and efficiently examine these cases. He finally raised the point of emotional trauma for families of the disappeared: “How to deal with the pain and agony of those thousands of person who are still looking for their loved ones?”. He expressed the necessity to put in place psychosocial support services for relatives of the disappeared in order to assist them in their healing process. Before closing, the participants learned about ICCPED and its Committee through the video presentation of the Committee member, Mr. Luciano Hazan. Mr. Hazan provided detailed explanation of the Convention and emphasized the importance for a country like Sri Lanka to ratify the treaty to sufficiently address the issues of disappearances. Finally, Dr. Fernando discussed the fact that families members of the disappeared have not been consulted in the establishment of the previous commission to investigate into complaints regarding missing persons. She stressed that the first imperative step to ensure the legitimacy of any mechanism to clarifying the fate of missing persons, is to conduct public consultations with the civil society and those affected by abuses. She concluded by welcoming the OISL report and stressed that in order to move forward, it is essential for the GoSL to implement the report’s recommendations and ensure victim centeredness of their reforms. She urged the international community to assist and support Sri Lanka in its journey for truth, justice and accountability.